Supported teenagers via the local High School Work Experience programs. Provided career paths to teenagers and young adults in a joint venture with Wests Junior Rugby Union Club. Donated plants and sustainability products to local schools. Donated trailers to raffles for the community to raise funds for their sporting projects. These trailers are then filled with appliances, groceries and other goodies to raise funds for the sporting projects. These funds have provided opportunities for players to participate in cultural exchange programs internationally and nationally. Conducted talks and information sessions on gardening, sustainability and running a small business. 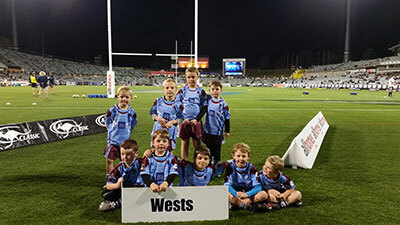 2014 Under 7’s team at Canberra Stadium at half time during a Brumbies Super 14 Rugby game.